BARCELONA • Valencia defender Ezequiel Garay is relishing the prospect of coming up against a wounded Barcelona side today. Barcelona will break a 38-year record by avoiding defeat against Valencia today. But Garay and Co. are keen to stop the Catalan giants' unbeaten league run at 38 games and prevent Ernesto Valverde's men from becoming the first LaLiga team to enjoy an invincible season. Barcelona are returning to the Nou Camp following Tuesday's collapse in Rome, where they threw away a 4-1 first-leg advantage over Roma and crashed out in the Champions League quarter-finals. "Hopefully they are feeling quite hurt and that this isn't their game, and hopefully everything will go well for us to get an important victory there," Garay told Radio Marca. "We know that it was a very tough blow to take and I think, in that respect, we have to take advantage." Getafe are the only team this season to keep a clean sheet at the Nou Camp but Valencia have been hard to break down in recent times. In their last five league games, Marcelino Garcia Toral's men have conceded just one goal. 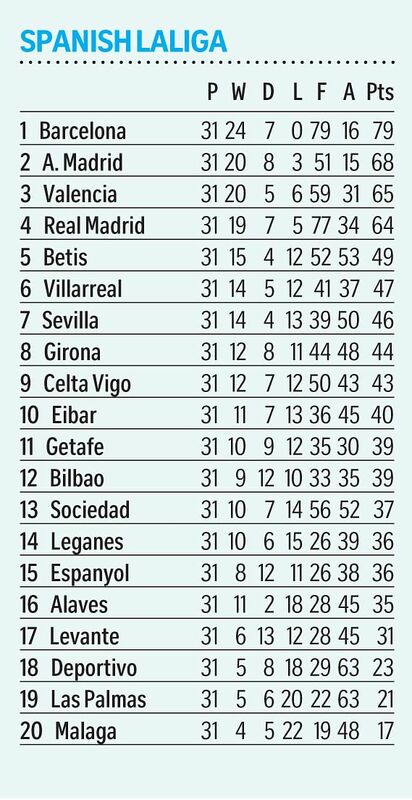 Valencia, who climbed above champions Real Madrid into third last weekend, are two wins away from sealing a return to next season's Champions League. And former Valencia forward Miguel Angel Ferrer told the club's website: "It is the perfect time to go to the Nou Camp, Valencia are flying high." Valverde admitted in a press conference yesterday that Barcelona are feeling "sorry for ourselves" but challenged his players to bounce back from "possibly our second worst moment of the season" after August's two-legged Spanish Super Cup final defeat by Real Madrid. "We cannot stay at home crying. .. If we continue to dwell on (the Roma) game, we will keep losing," added Valverde, whose side will be looking to better the mark set by Real Sociedad in 1980. "I'd like what happened in Rome to be a positive, just like it was in August when we were defeated. "That seemed like a catastrophe at the time, but we plugged ourselves in and pushed forward to put things right." Barcelona, 11 points clear of second-placed Atletico Madrid, could still end this campaign by winning a league and King's Cup double. They need 10 points from their seven remaining league games to clinch the title, and will play Sevilla in the King's Cup final next Saturday. Barca beat Valencia 3-0 over two legs in the King's Cup semi-finals but Valencia came eight minutes from victory in the reverse league fixture in November, when Rodrigo Moreno's opener was cancelled out by a late Jordi Alba equaliser. Rodrigo, with six goals in his last five games, will have a point to prove too this weekend as LaLiga's top Spanish scorer aims to secure his place in the national squad for the World Cup.